Water soluble derivatives from Cannabis have an increasing interest and market is growing up quickly. From pharma from a daily product, thoses derivatives with different and tunable THC content are still difficult to produce as the know how is still to build up in some new start-ups. The goal of this webinars is to show what Microfluidics Technology can bring you if you are developping such products. Tim Jochum has a B.Sc. in Chemistry from Texas A&M-Corpus Christi, and a M.Sc. in Material Science from the Colorado School of Mines. 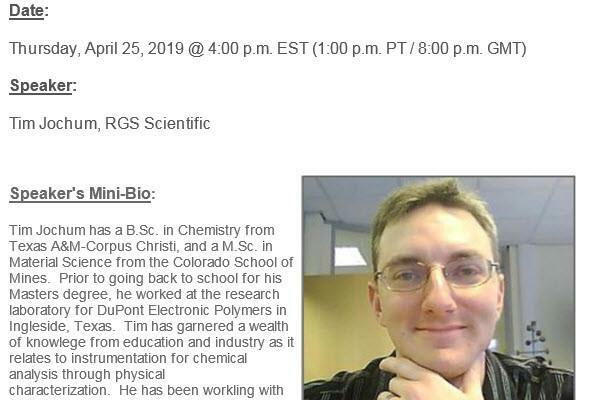 Prior to going back to school for his Masters degree, he worked at the research laboratory for DuPont Electronic Polymers in Ingleside, Texas. Tim has garnered a wealth of knowlege from education and industry as it relates to instrumentation for chemical analysis through physical characterization. 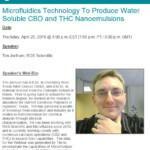 He has been workling with RGS Scientific and Microfluidics since 2010, and is currently working closely with numerous cannabis operations (CBD and THC) to expand their capabilities. The data for the Webinar was generated by Tim to demonstrate the capabilities of Microfluidizer technology, using an M-110P.